Pakistan released 68 Indian fishermen and 61 Afghan nationals as a ‘goodwill gesture’ to the two neighboring countries. Speaking to Media Karachi’s Superintendent District Jail Malir Afaq Sami said the Afghan nationals, imprisoned under various charges, were released on Saturday and have been taken to Quetta, from where they will leave for Afghanistan through Chaman border. Indian fishermen have boarded a train to Lahore from where they would be taken to the Wagah border and handed over to Indian authorities.“We got orders from the Interior Ministry on Saturday to release the Indian fishermen,” Sindh province’s Home Department official Naseem Siddiqui said. The fishermen were taken in covered police vans in full security to the railway station, where volunteers of the Edhi Foundation distributed cash and gifts among the fishermen who were overjoyed to be returning home.More than 200 Indian fishermen are still languishing in various jails in Pakistan. Pakistan and India routinely arrest fishermen who cross water boundaries for illegal fishing. 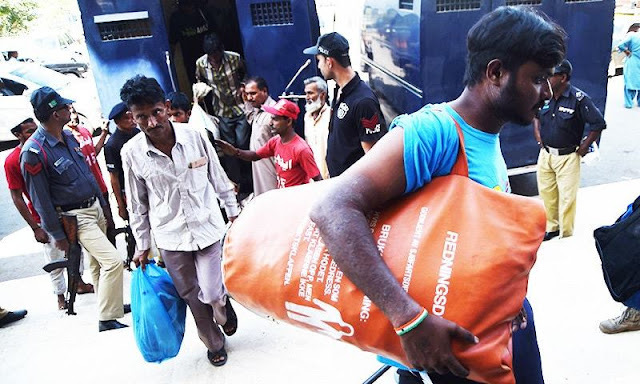 The two countries have not reached an agreement on maritime boundaries.Pakistan freed a group of 78 Indian fishermen in July this year.However, authorities in the two countries released a few of these poor fishermen from time to time as ‘goodwill gesture’.